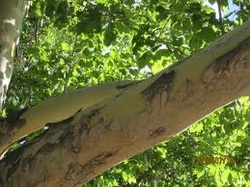 The bark is an attractive patchwork of white, tawny beige, pinkish gray, and pale brown, with older bark becoming darker and peeling away. 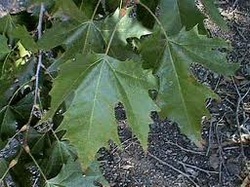 Platanus racemosa is the dominant species in the globally and state endangered sycamore-alluvial woodland habitat. New leaves are a bright translucent green and somewhat woolly. The deciduous tree drops copious amounts of dry golden to orangish red leaves in the fall. The London plane is very tolerant of atmospheric pollution and root compaction, and for this reason it is a popular urban roadside tree. It is now extensively cultivated in most temperate latitudes as an ornamental and parkland tree, and is a commonly planted tree in cities throughout the temperate regions of the world. The tree is fairly wind-resistant. However, it has a number of problems in urban use, most notably the short, stiff hairs shed by the young leaves and the dispersing seeds; these are an irritant if breathed in, and can exacerbate breathing difficulties for people with asthma. The large leaves can create a disposal problem in cities. These leaves are tough and sometimes can take more than one year to break down if they remain whole.